FRIDAY, APRIL 26 — On day 4 we took a day trip to Belfast in Northern Ireland. We left on a bus at 8:30 a.m. with our fabulous tour guide and a group of about 40 people from Beth’s company. It was a pleasant two-hour ride through the rolling green hills of the Irish countryside. Going from Ireland to Northern Ireland was a bit like driving between U.S. states. There was no visible border between the countries, but you knew you crossed into Northern Ireland when the speed limit signs displayed miles instead of kilometers. Our first stop in Belfast was the Titanic Belfast, an iconic building that houses an amazing museum. Even those weary of the oft-told story will be amazed by the Titanic Experience, an interactive exhibit spread over five floors and nine galleries that tells the Titanic story in a fresh way. 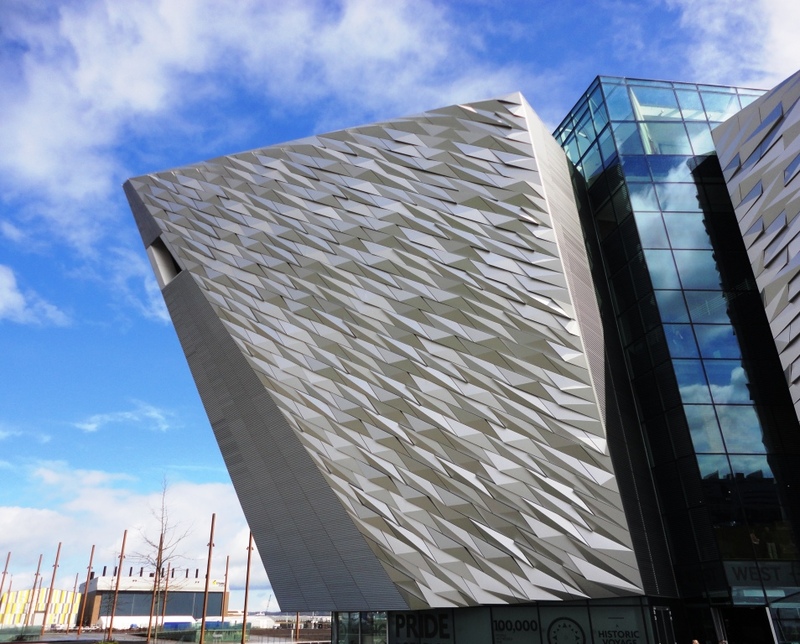 The museum covers the construction and launch of the Titanic in Belfast, its infamous maiden voyage, the aftermath of the sinking, and discovery of the wreckage. After the fascinating self-guided audio tour of the museum, our group was treated to a private catered lunch. We had even more time to explore the museum after lunch, but since Beth and I already had our fill of Titanic lore, we decided to look for a beer. There was a café on the ground floor where we found bombers of Titanic Quarter Beer. We grabbed two bottles and sipped them while waiting for the next part of our bus tour. Titanic Quarter Beer is an English Pale Ale (4.2%) brewed by Hilden Brewing Company in Lisburn, Northern Ireland. It is named for an area of Belfast that is home to Titanic Belfast, the centerpiece of an urban waterfront renewal project. After leaving the museum, we took a driving tour through Belfast, a city with an extraordinary history. At our last stop in Belfast – the impressive City Hall – I tried to find a six-pack for the long bus ride home, but no luck. Our next beer would have to wait until dinner in Carlingford. Carlingford is a beautiful coastal town about halfway between Belfast and Dublin that boasts two castles. We pulled into Carlingford for dinner, and after a quick walk through the medieval streets, we settled into The BayTree Restaurant. Now BayTree isn’t really a pub, but I had to mention it here because our dinner was the best meal of our trip. I started with a Caesar Salad with Chorizo, Roast Red Peppers, and Parmesan Shavings – one of the best Caesars I’ve ever had. My main course was fresh oven-baked breaded plaice served with mashed potatoes – a nicer variation of your typical fish and chips. Dessert was Raspberry Baked Alaska, but Beth’s Sticky Toffee Pudding with hot toffee sauce stole the show. We made up for it later with a couple of Harp tallboy cans that I bought at a pub to-go before boarding our bus for the hour-long bus ride back to our hotel in Dublin.